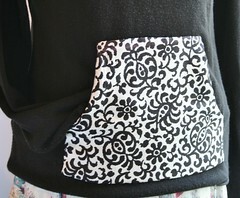 I just finished up this quick project and wanted to share it with all of you. 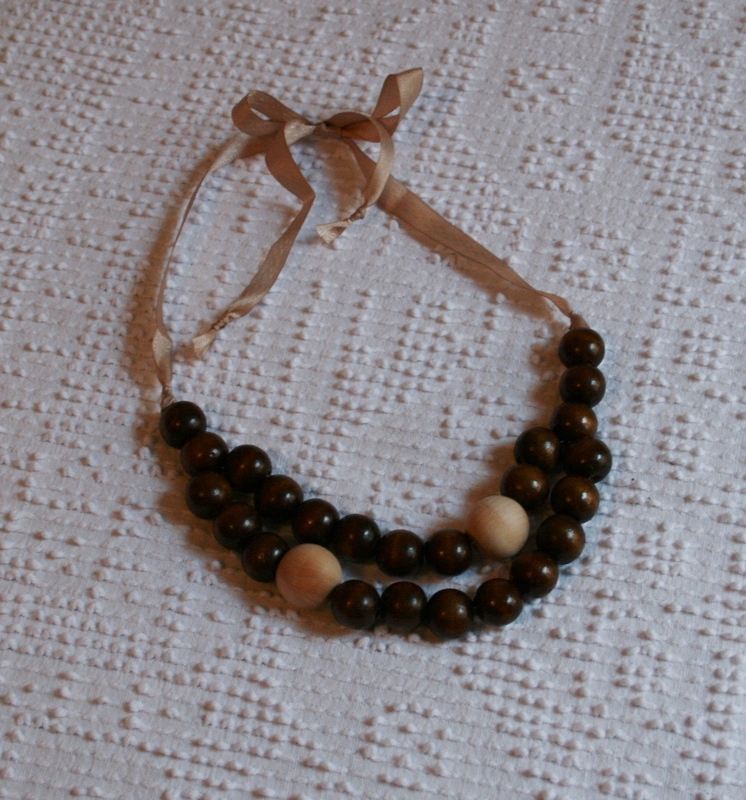 All two of you… This simple wooden bead necklace was one of my finds at the consignment sale I attended last month and cost a whopping $5.00! 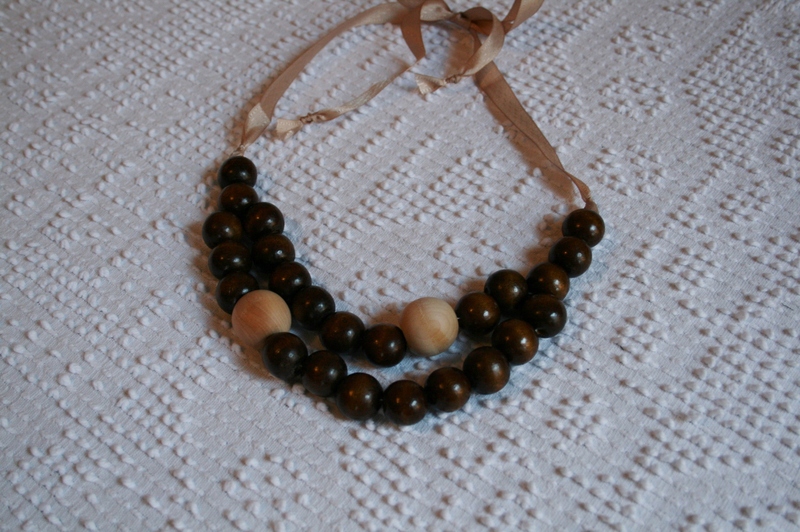 Initially I thought I would leave it alone and wear it for a while as is, but after perusing Pinterest, the online bulletin board for web surfers, I could not resist some tweaking. I mean really! Just look at all these great ideas. 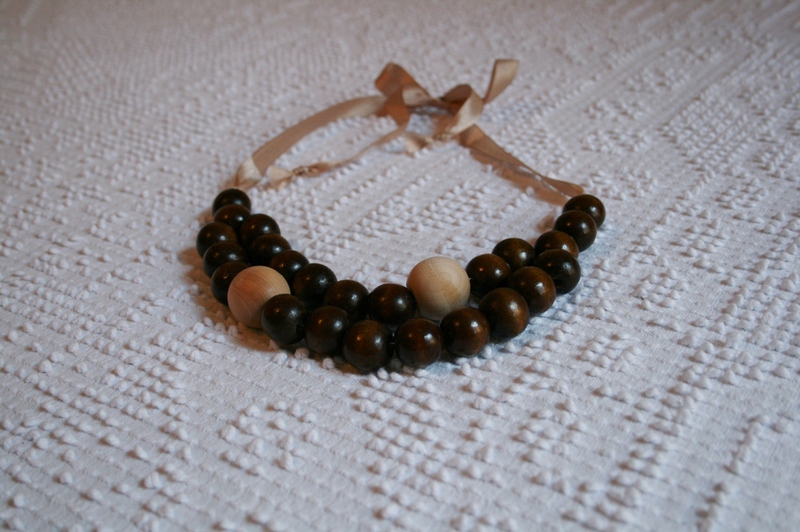 Simple wooden beaded necklaces, part of the collection at Le Voyage Creatif on Etsy. 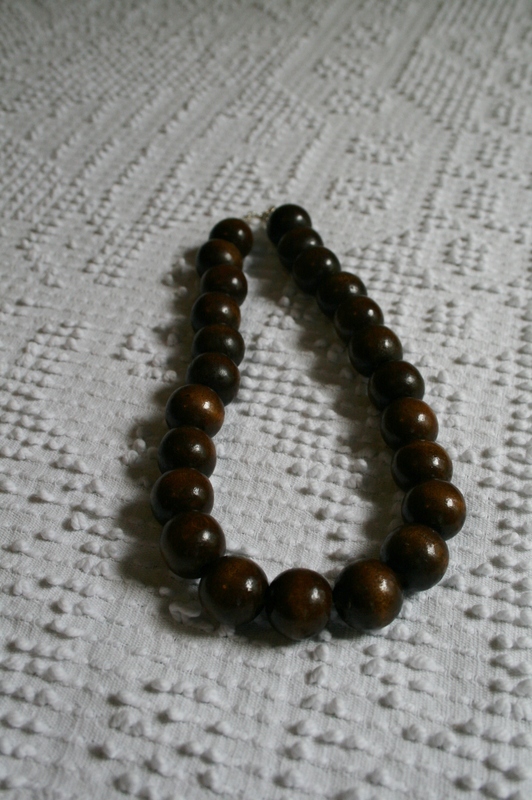 Wooden Bead Necklace, with no origin. I searched the internet, but could not find the source for this one. It’s beautiful though. 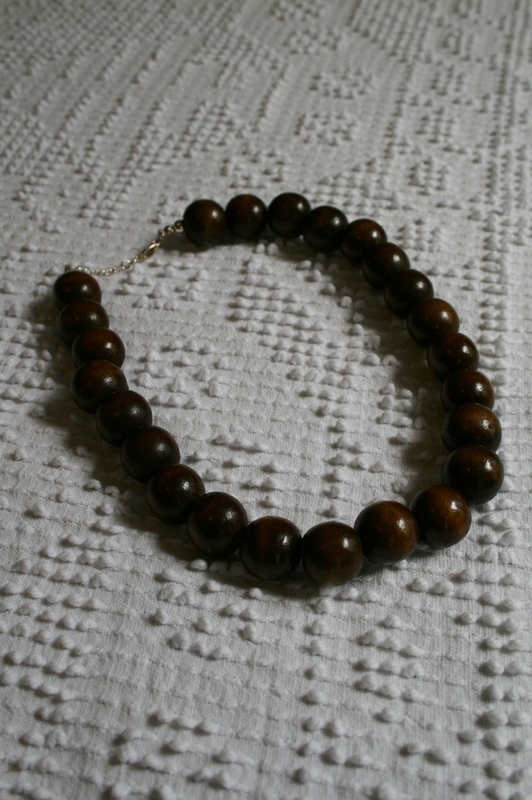 So, with my dark stained wooden bead necklace in hand I set out to create something new. 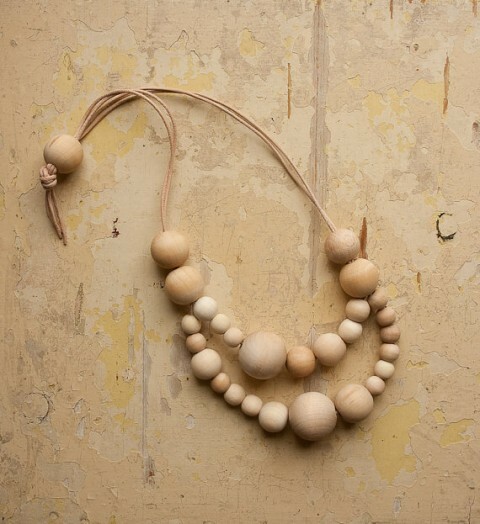 I loved the asymmetrical designs I found online and the use of natural wood rather than stained or painted beads. I also really wanted to add something with a ribbon tie to my jewelry box. 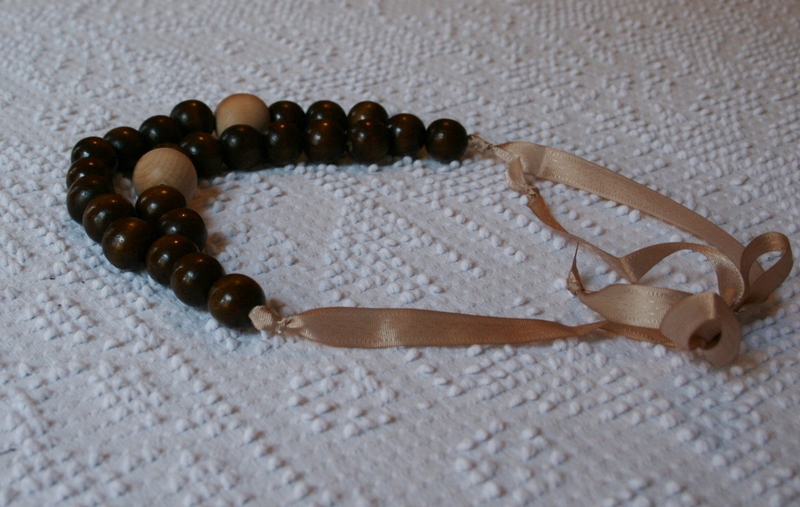 With all of this in mind I dug around my craft bins and managed to scrounge up some wire to make two jump rings for connecting the ribbon to the string of beads, natural wood knobs in a size slightly larger than the ones in the base necklace and beige seam binding. 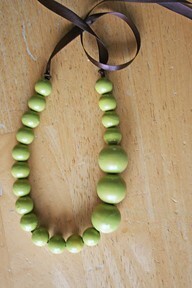 After cutting the necklace and letting the beads loose, I laid them out in patterns until I found the one I liked. I also drilled all the way through the natural wood knobs I was using as accents because the hole was meant for a screw and only went in about half way. I wrapped the wire in a circle to make two small jump rings and attached my tripled up thread to one, strung it through each line of beads and tied it off to the other jump ring. 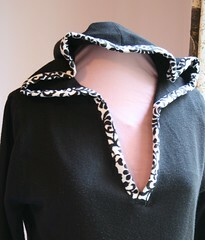 The last step was to tie the seam binding ribbon around the jump rings. 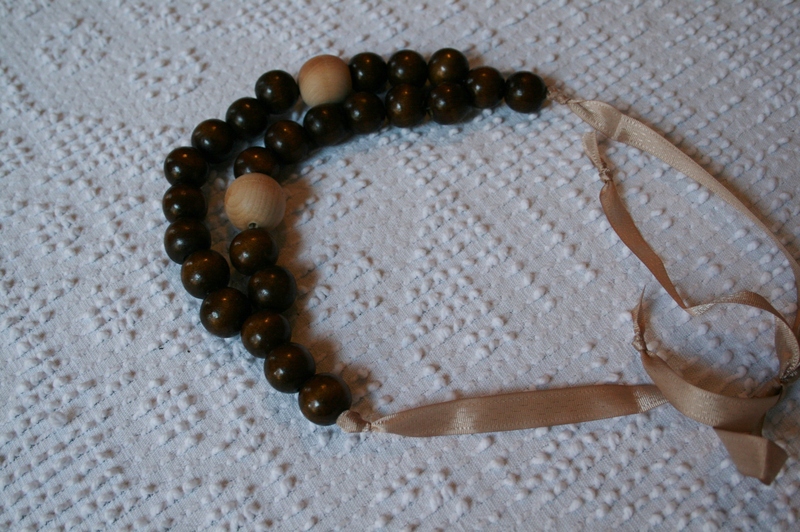 I did this in a way that covered the rings and the knotted strings, but I did find that I needed to tuck the ribbon ends up and over the knot to get the clean look I desired. A couple of quick stitches later and the ribbon ties were secured into place. 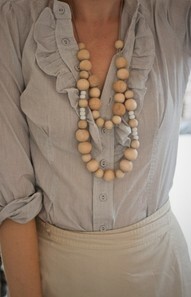 PS-Click on through here to follow me and my Pinterest boards! We want to see a pic with it on!